Prosperous and cosmopolitan, Denver holds rank among the largest metropolitan areas in the United States. In the 1850s, the gold rush led hopeful prospectors to the city, nestled at the foot of the Rocky Mountains’ Front Range. More than a century and a half later, 2014 ushered in a new wave of entrepreneurial energy into the Mile High City (so named for the town’s location roughly 5,280 feet, or one mile, above sea level). This time, investors are arriving to cash in on new opportunities created by the state’s legalization of marijuana. 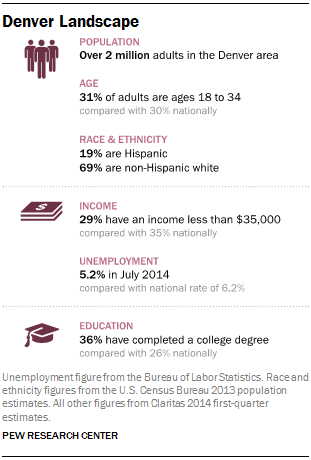 Unemployment within the Denver area itself is 5.2% as of July 2014, lower than the national average. (For a display of all city demographics, click here. But the metro’s key employers are not associated with commerce or consumerism. Four of the region’s top five employers (by numbers of workers) are linked to governmental services: the U.S. government, the state of Colorado, the University of Colorado, and Denver Public Schools. Including Boulder, the Denver region has also emerged as a tech startup hub, headquarters to MapQuest, Photobucket, Datalogix and others. While 40% of households in Denver earn $75,000 or more per year, the higher annual salary also reflects higher costs of urban living. Despite widespread prosperity, roughly 29% of Denver households earn less than $35,000 annually. More than 2 million people live in the Denver metropolitan area, which stretches across 10 counties in North Central Colorado and 185 registered neighborhoods within Denver. One-fifth (19%) of the area’s residents are Hispanic. 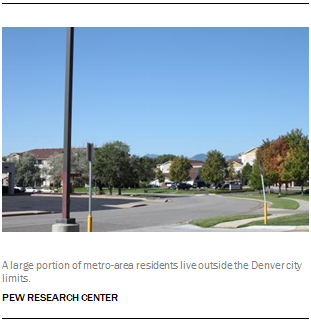 Residents of the Denver metropolitan area are young, highly mobile and highly educated. The 55+ population is smaller, relatively, than that of the nation overall, and one-in-three Denver-area residents have completed a college degree (bachelor’s or more). The Denver media market serves a sprawling and diverse population, thus a defining trait is its abundance of offerings. Researchers identified nearly 150 news sources across the metro area, from print and digital publications to television and radio broadcast operations. Perhaps owing to its status as a tech hub, combined with its younger population, the area is also immersed in digital media. Of the 143 news sources identified, 25 are “digital-only outlets,” as opposed to legacy organizations based in print or television. Finally, the size of the region’s population has allowed communities of interest to emerge as part of the media landscape, in addition to the geographically bound communities that are served by hyperlocal media. News sources focused on niche topics germane to the Denver region, such as business, law, development and others, serve the area alongside general interest outlets. As in most metropolitan communities, the major daily (in this case, The Denver Post) and local broadcast affiliates of major networks continue to exert significant newsgathering horsepower and audience market share. But the long tail of other news sources, some of them journalistic publishers, others not, help make the Denver area into a diverse media ecosystem. For more than 100 years, Denver had a pair of vigorously competing daily newspapers: The Denver Post and The Rocky Mountain News. The dueling publications engaged in an all-out newspaper war for the city’s readers. But the battle was costly. Denver’s papers were hemorrhaging cash and could not sustain slashing ad rates and newsstand prices in order to compete with one another. In 2001, the two papers entered into a joint operating agreement—an arrangement in which the competing publications shared facilities and presses, while maintaining editorial independence. As the metropolitan region’s primary daily newspaper, The Denver Post, now owned by Digital First Media, ranks as the 11th largest in the nation, with a Monday-to-Friday circulation of 351,240, according to the Alliance for Audited Media. 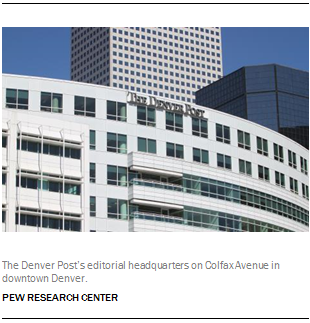 The Denver Post has a prominent web presence within the region and updates its site throughout the day. Beyond its primary web domain, the paper has launched two standalone verticals—The Cannabist, which chronicles the city’s marijuana beat, and Reverb, which focuses on Denver’s arts and entertainment scene. Both of these sites are routinely updated with new content several times a day. The Denver Post also hosts 10 blogs on topics ranging from health care to religion, and offers online podcasts, including The Press Box—a weekly radio program hosted by Post columnists, which is also streamed online every weekday. As a television market, Denver has seven stations that produce local news: ABC, CBS, NBC, Fox, PBS, CW and at least one public access station in the metropolitan area. Five of these television outlets—the city’s ABC, CBS, NBC, Fox and CW stations—update local content on their respective home pages several times a day. (Denver’s Fox and CW affiliates share online news content—so their webpages appear identical). Like The Denver Post, several of the city’s broadcast affiliates have developed verticals and blogs within their sites to provide expanded web-only content, such as CBS Denver’s local weather site. Arts, lifestyle, health, politics and beyond—the Denver media environment has given rise to blogs and other digital media that informs communities united by a common interest, and allows them to have a conversation. Here, Denver stands out compared with the other two cities studied—Macon and Sioux City—for its sheer numbers and variety. Pew Research identified 25 active stand-alone news websites in the Denver metro area, though there are undoubtedly additional ones.3 Of these, just seven may be classified as general interest in nature. The rest focus on narrower subjects such as politics, arts and entertainment, or real estate and development. National outlets, such as the Huffington Post and Eater, have established Denver-specific landing pages, containing a selection of locally focused stories. Independent bloggers and citizen journalists are also contributing to the digital news environment. A few sites, such as 5280Fire, rely heavily upon user-generated content as editorial fuel. Such engagement has increased the diversity of editorial voices in the city’s media ecology. One of these—denverarts.org—illustrates how some of these sites have emerged out of a perceived lack of attention to certain beats by legacy media. Ken Hamel, director of Denver Arts (a volunteer operation), told Pew Research that the number of local arts reviewers employed by local media has decreased over the years.4 Seven years ago, Hamel launched Denver Arts to “fill that vacuum” by providing news, commentary and event listings tracking the local gallery scene for a small but dedicated audience. The closure of The Rocky Mountain News acted as the catalyst for numerous digital media startups—several of which were developed by alumni of the defunct paper. One of region’s oldest news nonprofits, the Rocky Mountain Investigative News Network, was founded by a former staffer of The Rocky Mountain News. Also known as I-News, the newsgathering organization joined forces with the city’s public television and radio outlets in 2013. Other news nonprofits jointly operate with local universities, for example, Health News Colorado, an extension of the University of Colorado. And a few nonprofits have chosen to go it alone. Chalkbeat Colorado (once known as EdNews Colorado) has replicated its nonprofit model of education coverage in New York, Indiana and Tennessee. The site is not affiliated with a legacy platform or university. All but six of the digital-only news sites identified published new content on at least a weekly basis, with 11 publishing daily. Twenty-three of the 25 sites offered comment sections on their stories, though in only eight cases did readers use them during the period studied.5 Fourteen of the 25 sites were actively using Twitter, compared with 16 that were updating Facebook regularly. A large portion of the Denver metropolitan area’s residents live in the sprawling suburban communities that make up the nine surrounding counties, which include the sizable communities of Westminster, Arvada, Thornton, Centennial and Aurora. These communities are largely served by the dozens of community newspapers—most of them weekly—that blanket the region. Altogether, researchers tallied 28 community newspapers in the Greater Denver region. Some are independent, but many are owned by Colorado Community Media—the second-largest multimedia group in the state, according to the Denver Business Journal. Of these, the Aurora Sentinel is the only daily paper. The rest are weeklies. All of these papers publish news on the Web, though the majority of them do not update their home pages with new content on a daily basis. Of the 28 identified, only six were updating their home page on a daily basis. Many others were posting new content several times a week, or about weekly. For these community papers, digital audience engagement is limited. At least 24 of the papers studied offer comment sections below stories, but only one contained any recent comments.6 Just five of the papers operate an active Twitter feed. 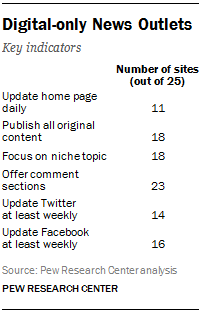 Facebook is more common, though still not ubiquitous, with 18 of the papers regularly updating their pages. The Denver area has sizable ethnic enclaves as well as critical mass around specific topics of interest. Each of these is large enough to allow for specific niche media outlets to serve those populations. 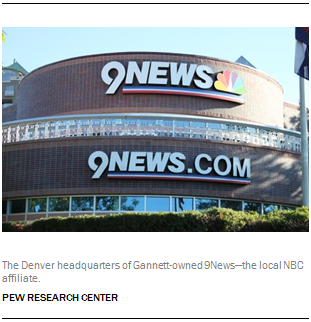 Analysts identified 35 such news providers in the Denver area. With about a fifth of the population identifying as Hispanic, many publications and outlets cater to this group. Of the 17 ethnic news outlets identified in the metro area by researchers, about half of them (nine) cater specifically to Hispanics and Spanish speakers. These include El Hispano and La Prensa de Colorado as well as The Denver Post’s Spanish-language edition, Viva Colorado. Univision and Telemundo’s local broadcasts round out the offerings to this community. Other ethnic publications serve the Asian community (such as Colorado Chinese News), the African-American community (African American Voice) and the Russian community (Gorizont). By and large, ethnic news in the Denver area is heavily focused on legacy platforms, which are mostly print, with some broadcast. Of the 17 outlets identified, 11 were updating their websites with local news content on at least a monthly basis at the time of study, and just one was updating daily. On the whole, the news outlets appeared to be slightly more active on social media than on their home page.7 Five outlets were actively using Twitter at the time of study, and 11 were doing so on Facebook. Thus, while a number of local media outlets exist in the Denver area to serve the Hispanic population, and social media offers a way to connect, Lopez thinks that direct contact, in places such as schools and churches, is the best delivery mechanism for information in that community. “That’s where folks are engaged. That’s where they’re getting their information. That’s where they’re understanding civic life,” he said. Beyond general interest newspapers and ethnic publications, the Denver metropolitan region hosts a broad range of printed media, including an alternative weekly (Westword), a number of city magazines, and trade publications. Researchers identified 18 of these serving the metro area. Seeking to capitalize on youth consumer spending power, Greater Denver’s lifestyles magazines (including 303 Magazine, Yellow Scene Magazine, 5280 Magazine) are geared toward reaching the region’s under-40 set. In addition, Out Front Colorado serves as the area’s primary print publication aimed at the lesbian, gay, bisexual and transgender (LGBT) community. The business community is served by the Denver Business Journal, Colorado Real Estate Journal, ColoradoBiz, Law Week Colorado and others. Researchers identified four major local radio stations airing local news on a regular basis. Broadly speaking, terrestrial radio stations in the city lacked expansive websites and did not appear to produce web-exclusive content. Colorado Public Radio—the network of National Public Radio member stations in the state—occasionally posts a story about the Denver area, but did not dedicate (as of July 2014) daily editorial energy to local content production. One exception should be noted, however. Community radio KGNU reposts content from its locally produced morning show each weekday. Finally, three university publications offer coverage of campus life and the surrounding areas: the University of Denver’s The Clarion, University of Colorado Denver’s The Advocate and Metropolitan State University of Denver’s The Metropolitan. In addition to dedicated news entities, many local areas have a range of organizations that provide some kind of news-related offering. Denver is a tech-saturated area, and its municipal and civic institutions reflect that in their efforts to inform their communities. What is represented here is not necessarily the activity of professional journalism, but it offers additional ways for local residents to stay informed about current and civic affairs. 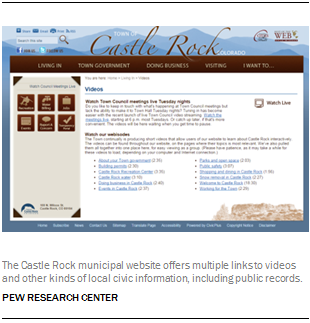 Pew Research analysts identified and studied 27 local government websites around the metropolitan area that regularly updated their websites with information about issues and events in the community or press releases about their own policy stances or legislative activities.9 These included the websites of local members of Congress, the mayor, regional counties and towns, as well as some police departments and other public service providers. These sites themselves are fairly active. About half (13 of 27) update their home page at least several times per week. Ten of the sites had video or audio links on the home page, while six offered access to some kind of publicly available data set. In general, the content provided by these sources is a mixture of practical information (how to pay a speeding ticket), community event listings, and news releases about need-to-know information. In the case of elected officials, content often includes press releases tracking the official’s activities. Rep. Mike Coffman’s website, for example, posts press releases and news coverage about the congressman’s recent activity. During the week sampled for content analysis, the site posted several press releases as well as a Denver Post story about the congressman’s request that the Department of Veterans Affairs investigate the agency’s treatment of a Denver veteran. And Rep. Ed Perlmutter’s page issued one e-newsletter that updated readers on the third installment of funding from the U.S. Treasury Department awarded to Colorado as a part of the State Small Business Credit Initiative. As part of a citywide transparency initiative devised by the city’s 13-member city council and mayor, government officials from the consolidated city-county have opened access to more than 100 data sets (known as the city’s “open data catalog”), including full access to the city’s “open checkbook”—a real-time look into municipal financials. City offices have also worked to provide interactive maps that show locations of city services, such as bike shares, dog parks and electric vehicle charging stations. For these local government-related sites, audience engagement seldom takes the form of comments the way it does on typical news sites. Instead, about one in three sites offer opportunities for citizens to provide tips and feedback. On social media, 22 of 27 sites operate an active Twitter feed, about the same number that maintain a Facebook profile (23). While many neighborhood associations—formal and informal—maintain an active social media presence in the Denver area, a handful also publish regular news items on their websites, or in some cases, print a newsletter and distribute it to residents. Researchers identified 11 such organizations in Denver. One of those communities—Cherry Hills Vista on the south side of the city—is presided over by George Gramer, a 62-year-old retiree who has “time to do things,” such as hold and attend community meetings and publish a quarterly newsletter that includes local advertising.10 Gramer noted, however, that the association’s Facebook page is maintained by a local high school student.